Report: No criminal charges in veteran fund flap. 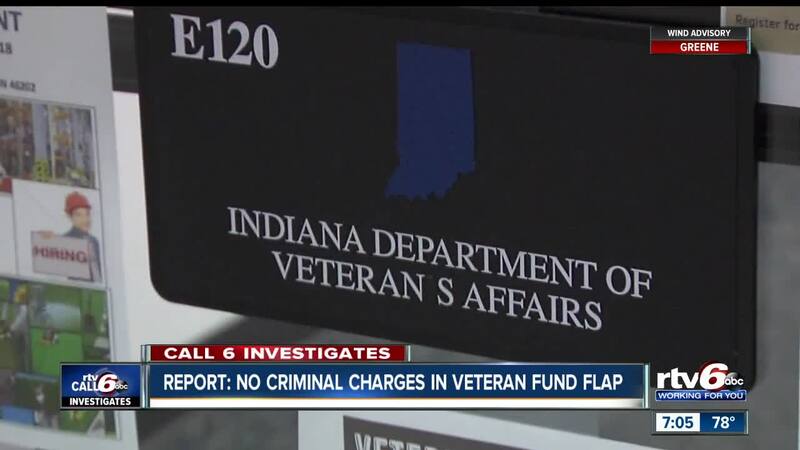 INDIANAPOLIS — An Indiana Inspector General investigation released this week found “a significant need for improved policies and practices” at the Indiana Department of Veterans Affairs, an embattled state agency that’s faced criticism for misusing funds meant to help struggling veterans. Despite criticism of the agency in its 18-page report , the Inspector General said it found insufficient evidence to support either criminal charges or an ethics complaint against any current or former IDVA employees including former IDVA director Jim Brown who resigned in December after Call 6 Investigates raised questions about misuse of the Military Family Relief Fund. The Inspector General shared its findings with the Marion County Prosecutor’s Office who also did not find sufficient evidence to support criminal charges. In November, Call 6 Investigates reported IDVA employees received benefits from the Military Family Relief Fund, above the $2,500 limit while the state agency denied other veterans. MFRF money is generated from specialty license plates and is meant to help veterans with food, utilities, and other needs. The Inspector General investigation found all of the IDVA employees who received Military Family Relief Fund grants did not assist in the processing, screening or approving of their own application. Doing so would have been a violation of the Code of Ethics’ conflict of interest rules, according to the report. The Inspector General also investigated allegations of the agency’s misuse of Temporary Assistance for Needy Families (TANF) funds meant to help veterans with marriage counseling, child care, and employment/training. The special agent investigated allegations an employee approved her fiancé to received TANF funds for a child that was unrelated to the fiancé. The Inspector General investigation found the employee was a contract worker at the time, not employed by IDVA, and there was insufficient evidence she processed her fiancé’s application. Meanwhile, the Indiana State Board of Accounts is conducting an audit into IDVA’s use of TANF funds, and the results are expected soon. The Inspector General also looked into concerns that IDVA employees were disclosing confidential information and shredding documents. The special agent could not find who specifically accessed the Military Family Relief Fund files, nor could he find any evidence that IDVA employees were shredding documents in violation of the record retention policy. Strictly comply with rules regarding the administration of the Military Family Relief Fund. Clearly document who reviews and approves each MFRF application; if an exception is granted to the $2,500 limit, the reasons should be clearly documented. Create a protocol to ensure MFRF grant recipients are using the money appropriately. Educate employees on the protection of confidential documents and personally identifiable information. Clearly communicate with any contract employees on what basis IDVA will pay them and how the employees should track their time. Hire a full time attorney to ensure the agency is following the rules including confidentiality, public access and record retention laws. The Inspector General report concluded that there was not sufficient evidence to support criminal charges or ethics complaints against current or former IDVA employees. Veterans Lisa Wilken and Will Henry, who were first to raise concerns about misuse of the Military Family Relief Fund, expressed anger and disgust for the Office of Inspector General report. Wilken credited “investigative journalism” for shining a light on the problems at IDVA. Veteran Will Henry said he provided the Inspector General’s office with hundreds of documents, but said he was never formally interviewed as part of the investigation. Henry expressed disappointment in the outcome of the investigation, including that there was insufficient evidence to support criminal charges or ethical violations. “When folks bend the system or lie on government forms to take money from a program they help administer and they do not quality for—that’s theft, that’s fraud, that’s abuse,” said Henry. Brigadier General James Bauerle suspects IDVA employees were attempting to cover up something when they shredded documents. “Bottom line -- looks like people got away with it and covered it up well enough to avoid violation of laws,” said Bauerle. Bauerle and other veterans have called for the firing of other IDVA employees who were responsible for misuse of TANF and other funds. The new IDVA director, Dennis Wimer, told Call 6 Investigates he is working on re-organizing the agency. Wimer released the following statement to Call 6 Investigates in response to the Inspector General report. “I want to thank the Inspector General’s Office for its hard work and dedication in identifying and eliminating fraud and abuse across the state. I believe the work of state government is best done in the public eye. As a result, I am committed to operating the IDVA openly and transparently to regain and retain the trust of our veterans and the general public. We have taken a close look at the Office of Inspector General’s report and have already begun implementing several of the recommendations. One change relates to the OIG’s recommendation to hire a full-time general counsel. This need was recognized immediately, and I am coordinating with the State Personnel Department to post for a general counsel who will have legal and other roles within the agency. The department will follow the state hiring process to allow any qualified candidate the opportunity to apply for the position. “The apparent gross mismanagement of the Indiana Military Family Relief Fund is unacceptable to the veterans community regardless if any actual law violations occurred,” said Indiana Legion Cmdr. Rodney Strong. “The preferential treatment given to employees of VA while many seemingly valid claims were turned away go against our principles in that there are no class systems of veterans. We all signed the dotted line, we all served. Recently, legislation was proposed at the Indiana State House to make VA employees ineligible for the IMFRF. While we support more stringent and transparent vetting of these claims in accordance with the IDVA Commission, we do not support the idea of barring these veterans any benefit they earned through honorable service. Dennis Wimer, who started his new role on January 28, told RTV6 in a previous interview he plans to make both big and small changes. A state audit issued in January sharply criticized the Indiana Department of Veterans' Affairs and the Indiana Veterans’ Affairs Commission for its “lack of controls” and mishandling of the Military Family Relief Fund, money generated from specialty license plates meant to help veterans with food, utilities and other needs. A 2017 audit by the Family and Social Services Administration of the Temporary Assistance for Needy Families (TANF) program also criticized IDVA for mismanaging funds meant to help veterans with marriage counseling, child care and employment/training. Veterans have expressed concern that aside from director Brown’s resignation, the rest of IDVA employees have kept their jobs despite scathing audits. Call 6: Have you read those audits yet? Wimer: I’ve read them once or twice. I’ve made my highlights and notes. Call 6: Is it safe to say changes will be made? Wimer: I think that’s the mandate coming in from the governor’s office — to restore confidence in the department, and that will require some changes to be made in how we operate. Some of those will be small, some of those will be larger. Call 6: How do you get the trust of the veterans back? Wimer: I’m honored to be in this position to be able to do that. We need to work hard to show them they can trust what we say and what we do. It goes back to my days at the Department of Workforce Development. Government is best done in the light of day and in the open. We want them to know we’re clear and we want to communicate well with them, so they can trust what we’re saying and what we’re doing. Wimer said restoring trust also includes an evaluation of IDVA’s budget. During his time at DWD, Wimer led multiple federal and state workforce programs, including Jobs for Veterans state grants, Jobs for Hoosiers and Hoosier Initiative to Reemploy Ex-offenders (HIRE) program. He’s also held positions at Butler University and LADS Consulting, a family-owned civil engineering consulting firm. Wimer said his main goal is for the state to better help struggling veterans. Despite all that he’s inherited, Wimer said he can turn things around. “I want to run an effective and efficient organization and that means being very cognizant about where these funds come from, and that we are clear and open with how they’re being spent and spending them well,” he said in February. Wimer’s salary as IDVA director is $117,000, records show.